It’s a disposable toothbrush . . . and toothpaste, floss, and pick. 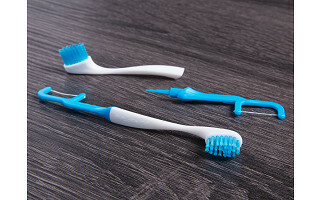 Brushee is a three-in-one, pre-pasted toothbrush that fits in the palm of your hand, your pocket, purse, or backpack. Whether you carry it with you, stash one in your desk, or keep it handy for overnight guests, it saves you the trouble of having to pack all those essentials separately. Maker Ian Rollin Berry even made sure the toothpaste created the least amount of foam so you won’t need water to rinse. Pack a Brushee—future you will thank you later. Hello everyone! I'm proud to introduce Brushee 3-in-1 portable toothbrush to The Grommet. I'd be happy to answer any questions you have! Looks great for camping, great idea Ian! @Steven Thanks, Steven! Much appreciated! It's definitely great for camping, especially since it doesn't require water! @Renee Thank you, Renee! You're too kind! Our Brushees come in blister packs of 3. So we recommend utilizing the packaging as a shield from those lurkers settled at the bottom of your bag. Essentially you would use one, dispose, and keep the remaining Brushee's safe in your purse with our packaging. Our next version in production, supports individually wrapped single Brushee's so you can just bring one and go! I'm going to wait for the individual wrapped product! Do you have a launch date? Seems a good idea but I have concerns about more "convenience" in our landfills. While our aim is to address the nearly 100% of adults that have cavities due to poor oral maintenance during the day. Providing the most eco-friendly and sustainable product is also paramount in our mission. And are factoring this into current developments. I can promise you, this will never be overlooked. I am happy to hear that you will have individual packets next. I have 11 grandchildren from 1st grade to college. All need portable hygiene! I will be tucking them in stockings, Easter baskets and college care packages. Thanks for the great product! If there is anything we can ever do, please feel free to reach out! We're building a family here at Brushee, and value relationship and feedback more than anything! Looks like a great idea, but you're missing one key bit of information. Exactly what sort of toothpaste is this preloaded with? We need an ingredient list. Especially as this is "made in China" I'm not interested in putting some unknown industrial chemicals in my mouth. @William Of course, William! My pleasure! Although made overseas, that does not reflect the due-diligence of our company in ensuring the most sustainably manufactured product. The Brushee is FDA Approved. And we have crossed all our T's and dotted all our I's to ensure we're bringing you the highest quality Brushee each launch. @David This is pure love right here. Anyone who wants the single pack, it looks like you would be able to use scissors to cut the blister packs in 3 vertical sections (without cutting into the blister.) You can also round off any sharp corners while cutting. I'm voting for this product with my purchase now. Ian, this is creative and ingenious--keep on innovating and making things better! 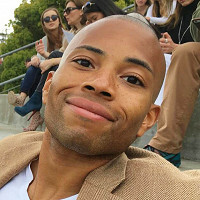 As a start-up CEO and creator at heart, one of the hardest things I've done was launch a product I know is going to change the way we live, with the budget we had. We have so much in store for the Brushee moving forward and providing the most environmentally friendly product is paramount. It’s a disposable toothbrush . . . and toothpaste, floss, and pick. 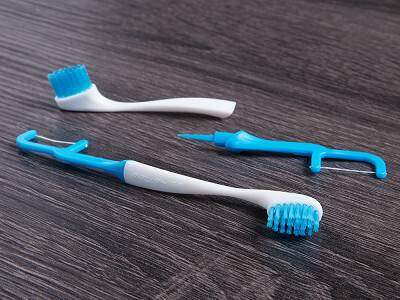 Brushee is a three-in-one, pre-pasted toothbrush that fits in the palm of your hand, your pocket, purse, or backpack. Whether you carry it with you, stash one in your desk, or keep it handy for overnight guests, it saves you the trouble of having to pack all those essentials separately. Maker Ian Rollin Berry even made sure the toothpaste created the least amount of foam so you won’t need water to rinse.